Below are some excerpts from the post The NED, Tibet, north Korea and Zimbabwe written by Stephen Gowans which help explain that the National Endowment for Democracy (NED) is really just the CIA in disguise. As part of the NED-program of regime change, governments the US foreign policy establishment targets for overthrow are demonized as anti-democratic while the recipients of NED largesse are angelized as pro-democratic. What links targeted governments is not their electoral democratic practices – which can range from absent to present — but their economic policies, which tend to be restrictive of foreign investment, imports, and property rights. What links the recipients of NED grants is not their attitude to electoral democracy, but their embrace of US policy. 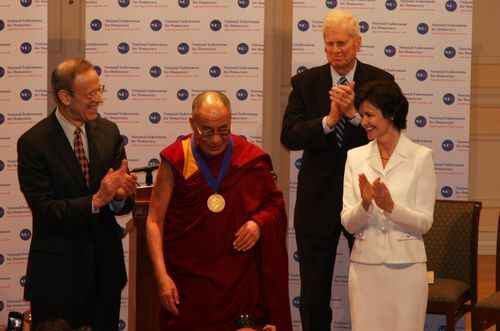 The NED’s angelization of the Dalai Lama is a case in point. The Dalai Lama is hardly a democrat, yet he has received Washington’s lucre for decades, including from the CIA and later the NED. Tibet’s “spiritual leader”, as he has been anointed in the West, presided over a backward theocratic feudal society, before fleeing to India after a botched uprising against the Chinese government, which had supported the dismantling of Tibetan feudalism.